I had a very good birthday this year where I received loads of fun presents. One of which was a gift certificate to our local cookbook store. (Yes I know, a store just about cooking.) I had a really fun hour in there trying to decide which of the many books on my wishlist to buy. In the end I settled on Madhur Jaffrey’s Quick and Easy Indian Cooking and Jamie Oliver’s Jamie’s Italy. So far so good. Last night I made a big pot of Labdhara Gosht / Smothered Pork and some Turmeric Rice from Madhur Jaffrey’s book. Of course I did modify the recipe a teeny bit, I added the mushrooms and spinach to get some vegetables in there, oh and the original recipe called for a skinned tomato, screw that action. The thing I really like is that once you have prepped everything you are pretty much done. Saute some garlic then throw it all in. Easy. 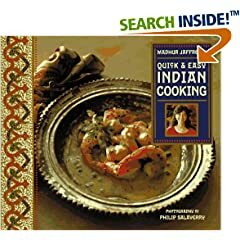 The only thing I am not sure about is her use of pressure cookers – that is what makes a lot of the recipes quick is the user pf pressure cookers. I haven’t ever used one before – does anyone have an opinion? If you do use a pressure cooker pork would take about 15 minutes according to her directions. Put all the ingredients except for the oil, garlic, spinach and black pepper in a bowl and mix. Put the oil in a large dutch oven and put over medium high heat. When the oil is hot put in the garlic and stir until it turns a medium golden brown. Now add the seasoned meat and give it a few stirs. Add 1/2C water and stir. Turn the heat to medium and cover. Cook for at least an hour, checking it every 20 minutes and stirring to avoid burning. 5 minutes before serving microwave the spinach according to the package directions and stir into the pot. If it gets to dry add water.